Goldendoodle's are a cross-breed obtained by breeding a golden retriever with a poodle. The original purpose of the cross was to attempt to develop guide dogs suitable for visually impaired individuals with allergies. Due to their affable, outgoing personality's, they make perfect family dogs and for people with disabilities. They are friendly toward other dogs and towards strangers, yet are protective of their family. 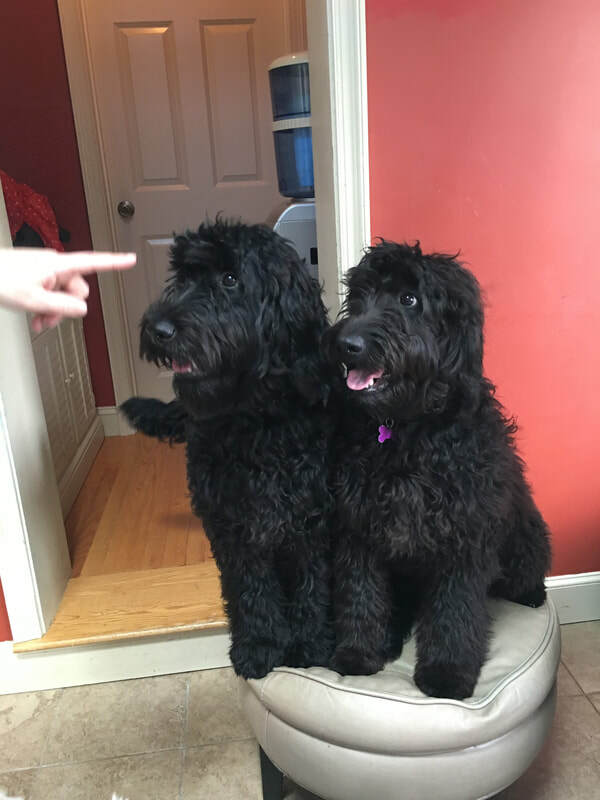 They very lightly, if not ever, shed and are very intelligent and learn quickly.They are goofy, fun-loving dogs that are full of charisma and character. While they may bark to warn you that someone is at the door, they are not excessive barkers. If you want an easygoing, fun dog, the Goldendoodle is for you. If you would like to know the difference between F1, F2, F3, F1b, F2b click here. Skylar is the matriarch and is the protector. She is loving and very affectionate and adores children. She is a great Mum and very attentive to her puppies and also to Penny's. She teaches all the puppies what is acceptable and what is not with a mummy's love. ​She is the daughter of an American Golden Retriever and a Chocolate Brown Standard Poodle. Penny loves being a Mum, no matter who's puppies are in the house Penny will take care of them. You will find her in with the puppies cleaning them and trying to feed them even when she does not have milk. She is sweet, enjoys to be around people and children, and loves to cuddle. Ruadh or Rua which both means Red in the Irish language. She was born in Ireland and came to join our family here in the USA. She has a beautiful red coat, and gentle loving personality. She loves nothing better than hugging anyone who visits and also likes to get in with the puppies and help clean and care for them. 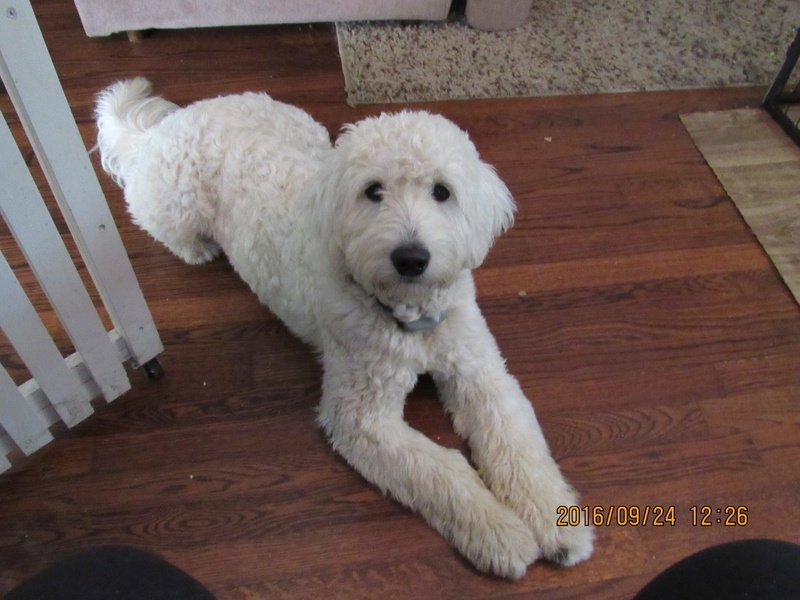 Charli's a F1 Goldendoodle loves to play and please. He is very sensitive to human emotions and is always happy. He loves to play and cant wait until the puppies are able to play with him. He crouches down on the ground and can spend hours playing with them. His mother is an white English Golden Retriever and his father is a 25lb white/silver Poodle. Loves to learn new tricks and always interested in what you are doing. Gentle and a wonderful dad caring, cleaning and loving to his puppies. Loves to play with them. Bono is a Standard Poodle. He is an affectionate trusting who loves to play and hugs. He was born in Ireland and is the decedent of purebred Irish and British Standard Poodles who are registered with the IKC & BKC. He is a wonderful addition to our family. Babysitting Puppy Scarlett for the weekend.